LuPone began her professional career with The Acting Company in 1972 and made her Broadway debut in Three Sisters in 1973. She received the first of six (as of 2014) Tony Award nominations for the 1975 musical The Robber Bridegroom. She won the Tony Award for Best Actress in a Musical for her role as Eva Perón in the 1979 original Broadway production of Evita. She played Fantine in the original London cast of Les Misérables and Moll in The Cradle Will Rock, winning the 1985 Olivier Award for Best Actress in a Musical for her work in both. She won a second Tony Award for her role as Mama Rose in the 2008 Broadway revival of Gypsy. Other stage musical performances include her Tony-nominated role as Reno Sweeney in the 1987 revival of Anything Goes, her Olivier-nominated role as Norma Desmond in the 1993 original production of Sunset Boulevard in London, her Tony-nominated role as Mrs. Lovett in the 2005 production of Sweeney Todd: The Demon Barber of Fleet Street, and her Tony-nominated role as Lucia in the 2010 original production of Women on the Verge of a Nervous Breakdown. She also won two Grammy Awards for the recording of the 2007 Los Angeles Opera production of Rise and Fall of the City of Mahagonny; for Best Classical Album and Best Opera Recording. On television, she starred in the drama series Life Goes On (1989–1993) and received Emmy Award nominations for the TV Movie The Song Spinner (1995) and for her guest role in the sitcom Frasier (1998). She also had a role in the third season of the FX thriller series American Horror Story: Coven (2013–2014). Her film appearances include Witness (1985), Driving Miss Daisy (1989), State and Main (2000) and Parker (2013). LuPone was born April 21, 1949, in Northport, New York, on Long Island, the daughter of Angela Louise (née Patti), a college library administrator, and Orlando Joseph LuPone, a school administrator. Her great-grand-aunt was the celebrated 19th-century opera singer Adelina Patti. Her older brother Robert LuPone is an actor, dancer, and director who originated the role of Zach the director in A Chorus Line. In 1972, LuPone became one of the original members of The Acting Company, formed by John Houseman. The Acting Company is a nationally touring repertory theater company. LuPone's stint with the company lasted from 1972 to 1976, and she appeared in many of their productions, such as The Cradle Will Rock, The School for Scandal, Women Beware Women, The Beggar’s Opera, The Time of Your Life, The Lower Depths, The Hostage, Next Time I’ll Sing to You, Measure for Measure, Scapin, Edward II, The Orchestra, Love’s Labours Lost, Arms and the Man, The Way of the World. She made her Broadway debut in the play The Three Sisters as Irina in 1973. For her work in The Robber Bridegroom (1975) she received her first Tony Award nomination, for Best Featured Actress in a Musical. The Acting Company honored Patti LuPone on March 12, 2012 in an event called "Patti's Turn" at the Kaye Playhouse. In May 1983, founding alumni of The Acting Company reunited for an off-Broadway revival of Marc Blitzstein’s landmark labor musical The Cradle Will Rock at the American Place Theater. It was narrated by John Houseman, with LuPone in the roles of Moll and Sister Mister. The production premiered at The Acting Company's summer residence at Chautauqua Institution, toured the United States, including an engagement at the Highland Park, Illinois' Ravinia Festival in 1984, and played London's West End. In 1993, LuPone returned to London to create the role of Norma Desmond in the original production of Andrew Lloyd Webber’s Sunset Boulevard at the Adelphi Theater. There was much anticipation of LuPone appearing in another Lloyd Webber musical, the first since her performance in Evita. Her time in the show was difficult and she was abruptly fired by Lloyd Webber and replaced by Glenn Close who opened the show in Los Angeles and eventually on Broadway. She returned to Broadway in October 2005, to star as Mrs. Lovett in John Doyle's new Broadway production of Sweeney Todd. In this radically different interpretation of the musical, the ten actors on stage also served as the show's orchestra, and LuPone played the tuba and the orchestra bells as well as vocally performing the score. For her performance, she received a Tony Award nomination as well as a Golden Icon Award for Best Female Musical Theater Performance. In August 2006, LuPone took a three-week leave from Sweeney in order to play Rose in Lonny Price's production of Gypsy at Ravinia. Sweeney Todd closed in September 2006. On February 10, 2007, LuPone starred with Audra McDonald in the Los Angeles Opera production of Kurt Weill's opera Rise and Fall of the City of Mahagonny directed by John Doyle. The recording of the Los Angeles Opera production of Kurt Weill's opera Rise and Fall of the City of Mahagonny, featuring McDonald and LuPone, won two Grammy Awards, for Best Opera Recording and Best Classical Album in February 2009. Following the Ravinia Festival production of Gypsy, LuPone and author Arthur Laurents mended a decade-long rift and she was cast in the City Center Encores! Summer Stars production of the show. Laurents directed LuPone in Gypsy for a 22 performance run (July 9, 2007 – July 29, 2007) at City Center. This production of Gypsy then transferred to Broadway, opening March 27, 2008 at the St. James Theatre. LuPone won the Outer Critics Circle Award, Drama League Award, Drama Desk Award, and Tony Award for her performance in Gypsy. It closed on January 11, 2009. In August 2010, LuPone appeared in a three-day run of Irving Berlin’s Annie Get Your Gun, in which she played the title role opposite Patrick Cassidy, at the Ravinia Festival, directed by Lonny Price. In 2010, LuPone created the role of Lucia in the original Broadway production of Women on the Verge of a Nervous Breakdown, which opened at the Belasco Theater on November 4, 2010, and closed on January 2, 2011, after 23 previews and 69 regular performances. LuPone was nominated for a Tony Award, Drama Desk Award, and an Outer Critics Circle Award for her performance. In 2011, LuPone played the role of Joanne in a four-night limited engagement concert production of Stephen Sondheim's 1970 musical Company at the New York Philharmonic, conducted by Sondheim expert Paul Gemignani. The production starred Neil Patrick Harris as Bobby. Harris had previously worked with LuPone in the 2000 and 2001 concert productions of Sweeney Todd. The cast of Company performed the song "Side by Side by Side" at the 65th Tony Awards on June 12, 2011. LuPone made her New York City Ballet debut in May 2011 in a production of The Seven Deadly Sins, directed and choreographed by Lynne Taylor-Corbett. A piece she had previously performed, LuPone sang the role of Anna in the Kurt Weill and Bertolt Brecht score. LuPone concluded a 63-performance Broadway engagement of her concert with former Evita co-star Mandy Patinkin, entitled An Evening with Patti LuPone and Mandy Patinkin. The run started on November 21, 2011 at the Ethel Barrymore Theater, and ended on January 13, 2012. In the fall of 2012 LuPone appeared with Debra Winger in David Mamet's new play The Anarchist. Despite the play receiving less than stellar reviews from critics, LuPone received widespread praise for her role as Cathy. In June 2015, LuPone appeared in the Douglas Carter Beane play Shows for Days at Lincoln Center Theater. In October 2015, LuPone, along with the current Fantine on the West End, joined her cast-mates to celebrate the 30th anniversary of Les Miserables. LuPone is set to portray the lead role of Helena Rubinstein in the new musical War Paint on Broadway, beginning performances in March 2017 at the Nederlander Theatre. LuPone originated the role in its world premiere production at Chicago's Goodman Theatre during the summer of 2016. She is appearing as the inaugural act at a new cabaret space, 54 Below, in New York City in June 2012. According to the New York Times reviewer, "Nowadays Ms. LuPone generates more raw excitement than any other performer on the Broadway and cabaret axis, with the possible exception of Liza Minnelli.... And her brilliant show, conceived and directed by her longtime collaborator, Scott Wittman, deserves many lives, perhaps even a Broadway run in an expanded edition. It certifies Ms. LuPone's place in the lineage of quirky international chanteuses like Lotte Lenya, Marlene Dietrich and Edith Piaf, who, like Ms. LuPone, conquered show business with forceful, outsize personalities while playing by their own musical rules." 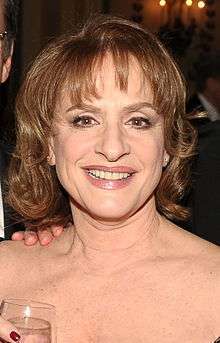 Among LuPone's film credits are Fighting Back, Witness, Just Looking, The Victim, Summer of Sam, Driving Miss Daisy, King of the Gypsies, 1941, Wise Guys, Nancy Savoca's The 24 Hour Woman and Savoca's Union Square (in post-production, late 2010), Family Prayers, and City by the Sea. She has also worked with playwright David Mamet on The Water Engine, the critically acclaimed State and Main, and Heist. In 2011, the feature film Union Square, co-written and directed by the Sundance Film Festival's Grand Jury Award Winner, Nancy Savoca, is being premiered at the Toronto International Film Festival. In it, LuPone co-stars with Mira Sorvino, Tammy Blanchard, Mike Doyle, Michael Rispoli and Daphne Rubin-Vega. LuPone opposes recording, photographs, and other electronic distractions in live theatre. "Where's the elegance?" she asked in a blog post on her official site. "I mean, I'm glad they show up because God knows it's a dying art form and I guess I'm glad they're all comfortable, sleeping, eating and drinking, things they should be doing at home and in a restaurant. But it's just not done in the theatre or shouldn't be." LuPone has been the subject of some controversy due to the bluntness of her statements regarding this matter. LuPone wrote a memoir, recounting her life and career from childhood to the present, which was released in September 2010. It was simply titled Patti LuPone: A Memoir, which was, according to LuPone, the winner of the competition she held to name the book. LuPone is married to Matthew Johnston. The couple were wed on the stage of the Vivian Beaumont Theater at Lincoln Center on December 12, 1988, after filming the TV movie LBJ; Johnston was a cameraman. They have one child, Joshua Luke Johnston (b. November 21, 1990). The family resides in Edisto Beach, South Carolina and Kent, Connecticut. 1993 Frasier Pam Episode: "Dinner at Eight"
2016 Steven Universe Yellow Diamond (voice) Episode: "Message Received"
LuPone recorded a duet with Seth MacFarlane (who was in character as Glenn Quagmire) on the 2005 album Family Guy: Live In Vegas. A new CD of one of her shows, The Lady with the Torch, was released in 2006 on Sh-K-Boom Records. In December she released bonus tracks for that CD only available on iTunes and the Sh-K-Boom website. A live concert special film, "An Evening with Patti LuPone", was filmed in July 2012 and released in November 2012 on SethTv.com with 104 minutes of Patti LuPone songs and stories with host Seth Rudetsky. ↑ "Theater Hall of Fame honors August Wilson, seven others". Pittsburgh Post-Gazette. Retrieved February 12, 2014. ↑ "Tony Awards past winners". Retrieved March 3, 2014. ↑ "Patti LuPone Biography (1949-)". FilmReference.com. Archived from the original on April 15, 2015. Retrieved 2008-07-06. ↑ Newmark, Judith (2009-03-29). "Patinkin, LuPone return to stage". Suburban Journals. Retrieved 2009-03-28. ↑ "Patti LuPone: Theatre Chronology". PattiLuPone.net. Retrieved April 3, 2012. ↑ "Kevin Kline Biography". Yahoo! Movies. Retrieved April 3, 2012. ↑ "Patti LuPone". All Movie Guide. The New York Times. Retrieved April 2, 2012. ↑ Alumni theactingcompany.org. Retrieved August 24, 2010. ↑ "Tony Awards, 1976 listing" broadwayworld.com. Retrieved August 27, 2010. ↑ "'The Water Engine' listing, 1978 ibdb.com. Retrieved August 27, 2010. ↑ " 'The Old Neighborhood' listing, 1997" ibdb.com. Retrieved August 27, 2010. ↑ "Internet Broadway Database listing, 'Working' " ibdb.com. Retrieved August 24, 2010. ↑ "Internet Broadway Database listing, 'Evita'" ibdb.com. Retrieved August 24, 2010. ↑ " 'Evita' Tony Awards listing (search) tonyawards.com. Retrieved August 24, 2010. ↑ " 'Les Miserables' listing, 1985" johncaird.com. Retrieved August 24, 2010. ↑ "Patti LuPone biography" pbs.org. Retrieved August 24, 2010. ↑ "Olivier Winners 1985" officiallondontheater.co.uk. Retrieved August 24, 2010. ↑ Internet Broadway database listing, 'Anything Goes'" ibdb.com. Retrieved August 24, 2010. ↑ "Internet Broadway database listing, 'Anything Goes' concert" ibdb.com. Retrieved August 24, 2010. ↑ "An Evening with Patti Lupone and Mandy Patinkin". Pattiandmandyonbroadway.com. Retrieved 2013-10-18. ↑ "intimate intensity: Mandy Patinkin and Patti LuPone". National Post. 2010-02-05. Retrieved 2010-03-27. ↑ "Tony-winning Patti LuPone to christen The Sharon Thursday". Villages-News. April 29, 2015. Retrieved April 29, 2015. ↑ Archived September 11, 2011, at the Wayback Machine. ↑ "LBJ listing" allmovie.com. Retrieved August 27, 2010. ↑ Arellano, Jennifer (2012-04-23). "'Army Wives': Kellie Martin talks Patti LuPone, Nicole's reveal | Inside TV | EW.com". Insidetv.ew.com. Retrieved 2013-10-18. ↑ "Army Wives "Battle Scars" Season 6 Episode 16". TV Equals. 2012-07-08. Retrieved 2013-10-18. ↑ Lesley Goldberg (May 12, 2013). "'American Horror Story: Coven' Books Angela Bassett, Patti LuPone". The Hollywood Reporter. Retrieved 2013-05-12. ↑ "Ramblings From the Road". Pattilupone.net. 2006-01-24. Retrieved 2010-03-29. ↑ Higgins, Charlotte (2009-01-27). "Gypsy – Rose Lee Photographs (Patti's Rant)". Guardian. Retrieved 2010-03-27. 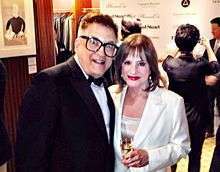 ↑ "Broadway diva Patti LuPone tells off shutterbug | Midwest Voices". Voices.kansascity.com. Archived from the original on February 6, 2010. Retrieved 2010-03-27. ↑ "''Patti LuPone stops 'Gypsy' mid-show to yell at a photographer'' – YouTube video". Youtube.com. 2009-07-01. Retrieved 2013-10-18. ↑ Azzopardi, Chris (2009-06-11). "GLT " Everything's Coming Up Patti". Gaylesbiantimes.com. Retrieved 2010-03-29. ↑ Rapkin, Mickey. "Patti LuPone: Ladys Night"Out Magazine. Retrieved August 17, 2010. ↑ Gerard, Jeremy (2008-03-04). "In 'Gypsy' Patti LuPone Creates Diva Role She Was Born to Play". Bloomberg News. Bloomberg L.P. Retrieved 2011-05-11. ↑ UK Singles Chart info Chartstats.com. Retrieved 26 April 2009. ↑ "Patti Lupone Concert Special". Sethtv.com. Retrieved 2012-12-06.